If you have a toddler or preschooler, chances are good you’ve been in on a play date recently. As a work-from-home mom, I look forward to play dates in which my son and I can both participate. They provide a great opportunity for him to play and socialize with other children, and for me to share a cup of tea and some much-needed adult conversation. Play dates offer more than just a few hours of fun with other kids. They also give children the opportunity to gain important social skills. When children engage in cooperative play, they learn how to take turns, share responsibility, and creatively problem-solve. I have friends who believe parents and caregivers should be completely hands-off during play dates and let the kids orchestrate their own creative play. That works just fine some of the time. As an educator and mom, I think the need to add some level of structure is in my DNA. Perhaps these ideas – one for each month – will help you find a happy medium for your child’s next play date. Enjoy this fun and easy treasure hunt for a St. Patrick’s day treat with the kids.Hide a pot filled with gold chocolate coins somewhere in your yard. Cut out several four leaf clovers from green construction paper, and write clues leading up to the pot on the clovers. Have fun with it, and take them on a journey through the house, or even through the neighborhood if you really feel adventurous. This is a great way to re-use those plastic Easter eggs. Using a permanent marker, write an upper case letter on the top half of the egg, and a lower case letter on the bottom half. Mix them up and place them in an old egg carton or an Easter basket. Let children match the upper and lower case letters as they put the eggs back together. Other ideas for how to use this activity; color identification, sorting, counting, patterns, creating word blends, and hide and seek. Here’s a great twist on the classic board game. You will need colored sidewalk chalk, and a 12-inch square tracer. We used a linoleum tile from the dollar store, but sturdy cardboard would work. Using the Candy Land board game as your guide, trace the tile with colored chalk and ask children to fill in the colors as you make a life-size Candy Land board game on your driveway or sidewalk. Next, use the colored cards from your board game to play this larger version. We opted not to draw the special stops on our game, and used only the colored cards. Gather up as many musical toys as you have, then add in homemade ones: a pan with a spoon, a sealed cup filled with rice, a bell, etc. Put on some background music, and then have all the children make their own music. Don’t be surprised if the concert turns into a parade. 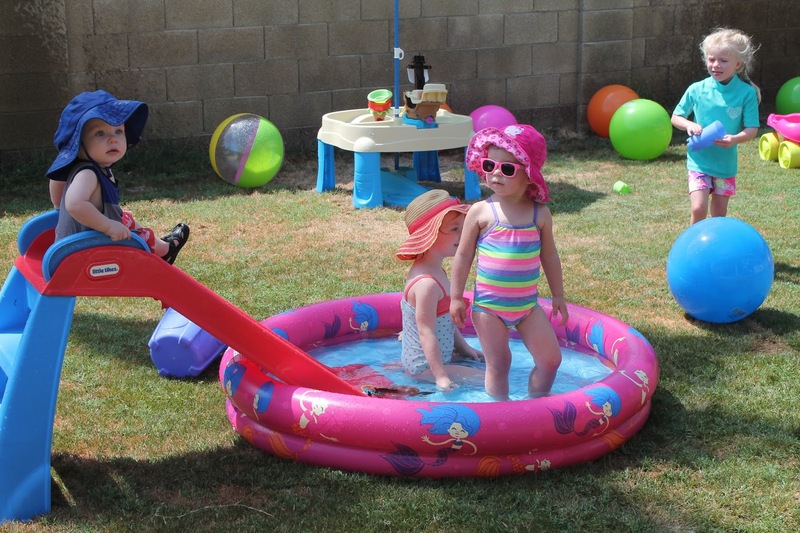 Invite children to bring their swimsuits and sunscreen for a play date. Provide sprinklers, a couple of shallow plastic pools, and a few water toys. Invite the other moms to bring their beach chairs and prepare to kick back, catch some rays, and enjoy watching the kids have a blast. Purchase a variety of different colored play-dough, or use the great home-made play-dough recipe below.To add some fun, provide tools that will help them squeeze, smash and shape the dough. Get out the cookie cutters and other objects to help enhance creativity.Plain Old Play Dough Recipe: Combine 1 cup flour, 1 cup water, ½ cup salt, 1 tbsp cream of tartar, 1 tbsp oil, and food coloring. Heat all ingredients in a saucepan over low to medium heat, and stir continuously. Once dough is at the consistency you want, remove from heat. Cool before using. This play date game is great for older children who can read, although it can be done with younger children with a parent’s help. Give each child a piece of paper, and encourage them to find something in the house that starts with each letter of the alphabet: A for apple, B for blanket, etc. They can write down what they saw, draw it, or have a parent write it for them. Provide miniature pumpkins, paint, glue, wiggly eyes, and markers, and encourage children to be creative. For added fun, give awards and prizes for the silliest, scariest, and most creative pumpkins. If children are in preschool or younger, try to have enough awards for everyone. Children’s Museum of Richmond is a great resource for families looking to have an adventurous play date. Our newly renovated VMFA and its next-door neighbor, the Virginia Historical Society, are great for younger kids, too. These last two are free, which makes the play date even more fun for parents. The holiday season is a great time to teach children about the joy of giving to others who are less fortunate. Invite friends over and encourage your guests to bring a gently used or new toy to be donated to a local organization, like Toys for Tots. This is a fun game that children of all ages will enjoy. Read The Gingerbread Man to children. The version by Jan Brett is our personal favorite. Bake or buy about a dozen gingerbread people. Hide notes with clues from the gingerbread man all over the house for the children to find.The last note should bring them back to the kitchen, where the gingerbread men have finally given up, and are waiting on a plate for the kids to enjoy. You will need a bowl of candy hearts and a set of chopsticks for each child. Place a bowl of hearts on a flat surface within easy reach of the players and hand each child a pair of chopsticks. Set a timer for two to five minutes, depending on the ages of your players. On go, children start removing hearts from the bowl using their chopsticks, placing the candies in front of them. When time is up, the player with the most hearts in front of them wins. It’s up to Mommy to decide if the time is right for eating them.